Lodi could be considered a hub of the local food movement, only because there’s always been a local food movement in this area. It’s just never been cool before. Of course I’m exaggerating: Lodi’s not really a hub of too much, to be honest, but there’s no exaggerating the vibrancy of local produce growers and farmers’ markets in the Finger Lakes. There’s a lot of agriculture around Lodi, but the large industrial crops are almost exclusively soybeans and feed corn. In recent years small farms offering CSAs have boomed, and more farmers markets have developed offering people the chance to feel closer to the food they eat and who produces it. Throughout my childhood during the summers in Lodi you could count on the farm stands that dot the country roads and highways providing much of your summer meals. With delicious sweet corn that explodes in your mouth to perfectly ripe peaches whose juice drips down your chin to the ubiquitous zucchini, there has never been a shortage of great local produce. It’s always one of the best things about being in Lodi in the summer. The Ithaca Farmers Market has been around for years and never disappoints with the great variety of produce as well as the diverse international food vendors and live music. This summer I became enamored of the Trumansburg Farmers Market which is much smaller by comparison but is off the charts when it comes to friendliness. Almost all of the vendors, which range from a goat dairy to cinnamon buns to specialty garlic in addition to the requisite produce are happy to engage in conversation, offer advice to novice gardeners and actually want to know what you think of their food. One of the best produce finds of the summer were the tomatillos from the Ithaca market pictured here. I had no clue what to do with them but the kind vendor offered me a salsa verde recipe which was to die for. 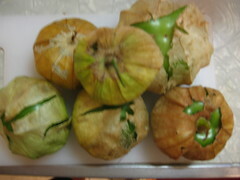 Now I’m hooked on tomatillos and am determined to grow them in the garden next summer. Salsa verde for all!